God Rock Radio…, Where God Rocks! 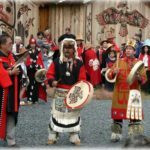 Jack “The Agnostic” Garcia examines the culture of the Haida peoples of the Northwest Pacific coast and also recites two of their sacred stories. Expert sea raiders and traders – the Haida have often been compared to the Vikings. 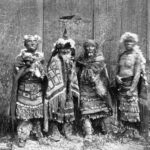 Among the wealthiest of all Indian nations, the Haida practiced slavery and were ruled by powerful chieftans who placed a high value on personal wealth and property. First off , Jack examines the Haida’s complex social system (Clans) societies that were linked to various Guardian spirit animals via family lineage and elaborate ceremony and ritual. 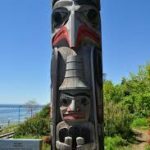 Next, its the Haida’s intricate splendor filled art (Totem Poles) exquisitely carved pillars engraved with elaborate heraldic designs that turned Haida villages into a type of surrealist forest. Jack also examines the Potlatch ceremony – a competition between rival chieftans in which goods and riches were given away or destroyed. Then Jack plays storyteller and recites – The Bear and his Indian wife and The origin of the Gnawing Beaver – magical and mystical tales that tell of the beginnings of the clans and their spiritual link to the animal realm. Five tracks hit forward to advance. This entry was posted in Uncategorized by grr. Bookmark the permalink.